2013 just a got a little better for Garbage Pail Kid collectors. Adding to a big year that has already seen the release of 2013 Garage Pail Kids Chrome and 2013 Topps Garbage Pail Kids Brand New Series 2, with more on the way, Topps is offering new posters and binders for the popular GPK brand through their online store. Both the binders and posters are limited edition releases and feature the colorful artwork that has become a familiar sight to GPK collectors. The numbering goes from four to nine because three Adam Bomb binders, each with different colors, were previously released and are considered the first three characters. The posters are 11x14 and are printed on a 14-point card stick with ultra-high gloss UV coating. 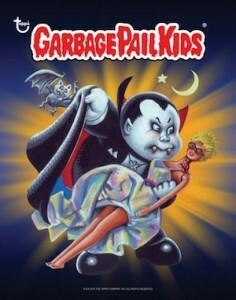 Although only one size is currently available, there are plans to offer larger-sized GPK posters in the future. There is also a value set that includes all six posters, plus an exclusive Adam Bomb poster that is not available for individual purchase. The deluxe full-color binders include the same images as the posters and are padded.